Former U.S. Rep. Mike Michaud is running for a three-year term on the East Millinocket Board of Selectmen. He was president of the Maine Senate, represented Maine’s 2nd Congressional District in Washington, D.C., and came within a few points of winning the Blaine House four years ago. Now, Mike Michaud wants to return to elected office, and he has his sights set on the East Millinocket town office. The Democrat is running for a seat on the Board of Selectmen in East Millinocket this year. If he’s elected, it might be among the most ambitious jobs he will ever undertake. He is running against a political newcomer, Tom McDunnah, for a three-year term, Town Clerk Erica Ingalls said Friday. McDunnah, 59, is a disabled former machinist who, like Michaud, worked at Great Northern Paper until 2002. Both have lived in East Millinocket and known each other for decades. The father of Police Chief Cameron McDunnah, Tom McDunnah said he didn’t mind the prospect of running against Michaud. “I like competition. I am not scared. The other two guys who were going to run for the seat, they backed out,” Tom McDunnah said Friday. “Mike’s a pretty big hitter, but I have always liked a challenge in my life. The 63-year-old Michaud had planned to retire from public office after serving as assistant secretary of labor for the Veterans’ Employment and Training Service in the final years of the Obama administration but said he saw an opportunity to help his hometown. The Katahdin region could use some help. Its single largest employer and taxpayer, the East Millinocket paper mill, closed in January 2014, eventually idling 256 workers. It owed 1,159 creditors $65 million but claimed only $28.15 million in assets. Its closure followed the loss of the Millinocket paper mill in 2008, which had about 150 workers when it closed. Both closures devastated the region’s economy. With practiced ease, Michaud can rattle off a list of projects he’s been working on since returning to his home in East Millinocket as a full-time resident a year and a half ago. He kept a house in town during his congressional years, visiting once a month or so, he said. Michaud is working with the owners of the former GNP site in East Millinocket, the nonprofit group Our Katahdin, to develop the property. He’s also helping the Medway Historical Society create a network of trails and lighted athletic fields at Medway Middle School. “I hope to really move this area forward quicker and try to get these things moving,” Michaud said. The former congressman said he now has the time to focus on his hometown. Republican Gov. Paul LePage defeated Michaud in his 2014 attempt to become Maine’s governor. Before that race, he spent 12 years in Congress representing the 2nd District. He worked at Great Northern Paper from 1973 until his first election to Congress in 2002, and he served 11 terms in the Maine Legislature — seven terms in the House and four in the Senate. 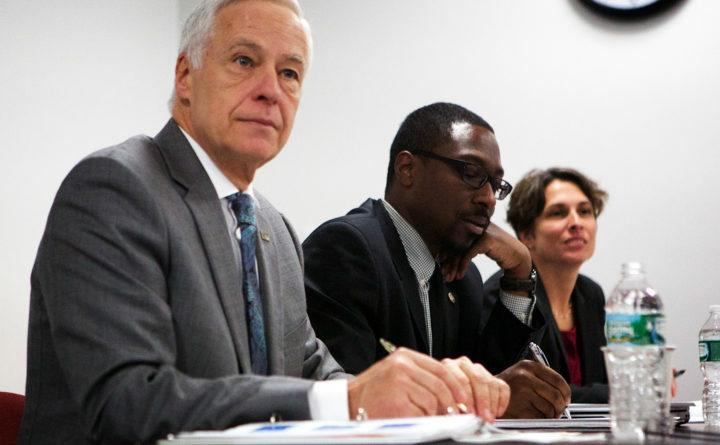 If Michaud wins next month, it would be his first time serving in town office. He said he has no plans to seek higher office.